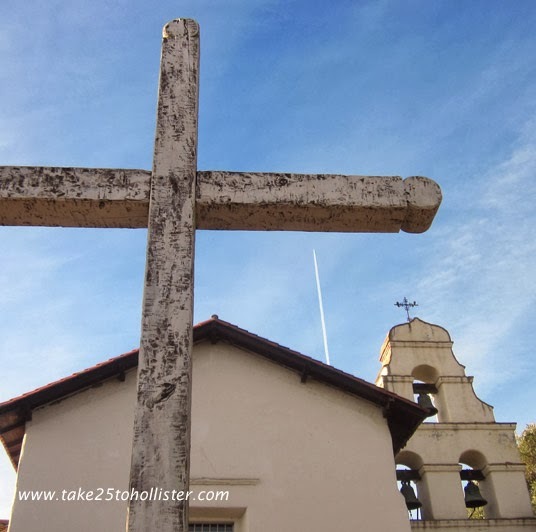 This week I've been posting about San Juan Bautista. I can't let the week go by without a stop at Mission San Juan Bautista, the 15th mission that the Franciscan friars established in California. Founded in 1797, the mission was built near the Popeloutchom, a Mutsun village. The mission did not have a bell tower at first. The one we see today was built in 1976 when the mission was being reconstructed. Originally, the mission's two bells hung from a wooden bell rack. The bells rung in the early morning, noon, and evening, according to Issac Mylar in Early Days at the Mission San Juan Bautista. He wrote,"They could be heard from six to seven miles away—yes, even over to the sheep ranch owned by Mr. Hollister, now the flourishing county seat of San Benito County." Note: So that FCC won't get on my case, the link to Issac Mylar's book leads you to Amazon.com. And, if you happen to purchase it via that link, I may get a bit of change for my effort of referring you to the page. Santana Gallery, at 115 3rd Street, is one of several art galleries in San Juan Bautista. 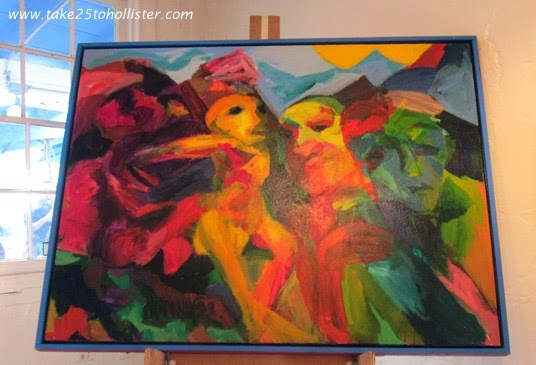 It opened last summer with an exhibit of the late Manuel Santana's paintings. Mr. Santana was known not only for his art work, but also for his community activism and for his popular restaurant next door to the gallery -- Jardines de San Juan. If you're like me, your first visit to Santana Gallery will make you think you've been there before. You have. The building was once the home to Galeria Tonantzin, which featured workds of contemporary women artists. I finally remembered when I saw the trap door in the floor that leads to a tunnel system which runs under the city. 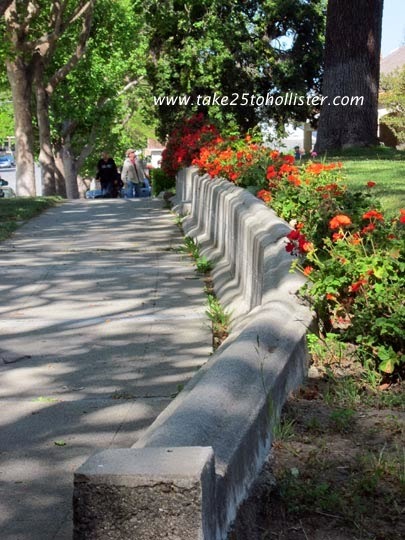 Who else remembers the fields upon fields of beautiful flowers about halfway between Hollister and San Juan Bautista on the south side of San Juan-Hollister Road (aka Highway 156)? As a kid sitting in the back seat, I looked forward to that stretch of the drive. And, today, those brilliant splashes of color come to mind when I first see the buildings of the old Ferry-Morse Seed Company in the distance. Ferry-Morse grew the flowers for seeds. I have no idea whether the seeds were directly sold in stores or if the horticulturists were experimenting to find the best seeds to eventually sell. Anyone know? Originally, the C.C. Morse Company bought about 900 acres of the San Justo Ranch, in 1910. Twenty years later, it merged with D.M. Ferry Company to become the infamous Ferry-Morse Seed Company. I don't know when Ferry Morse sold its San Juan Bautista branch. Today, Ag-Biotech, a company that offers plant genetic analysis services, has facilities there. 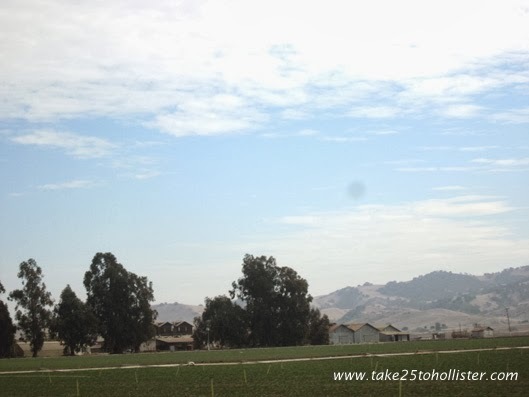 FYI: Since this past Sunday, I've been blogging about San Juan Bautista and the San Juan Valley. 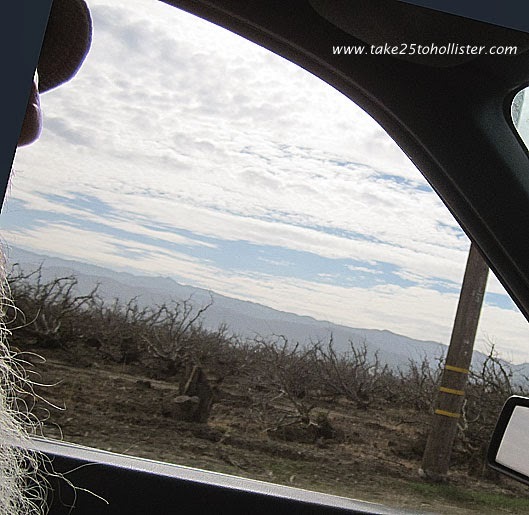 In the 1960s and 1970s, driving the back roads of San Juan Valley for me meant going by apple orchard after apple orchard after apple orchard. Today, many of the orchards have been replaced by vegetable fields. I wonder what will be going in place of the apple trees that were recently pulled out around Lucy Brown and Duncan Roads. 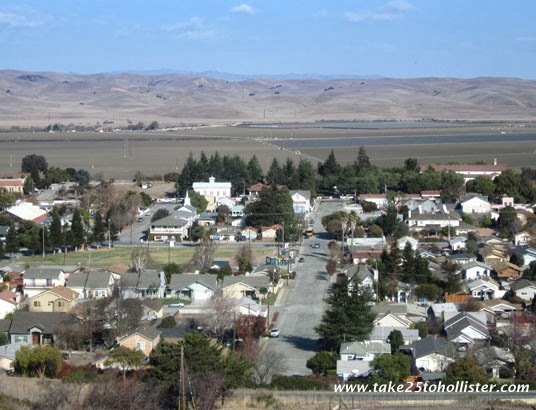 FYI: I'm blogging about San Juan Bautista this week. Here are yesterday's post and Sunday's. Have you taken more than a glance at the cool sign in front of Windmill Market in San Juan Bautista? It most definitely tells the truth. 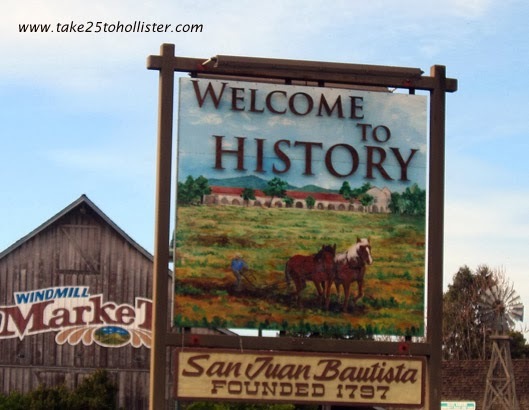 San Juan Bautista is about 7 miles west of Hollister. If you're driving south on Highway 25 from the 101 exit, you would turn right at the traffic light where 25 intersects with Highway 156. It's a nice drive through San Juan Valley to the second largest city in San Benito County. In 2012, its population was about 1,900. 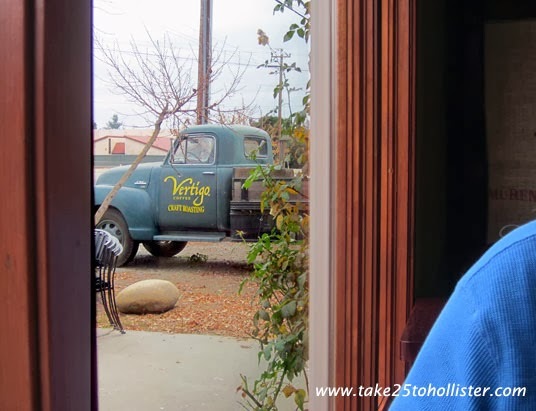 If you love very small cities, then take a stop in San Juan Bautista. FYI: I'll be blogging about San Juan Bautista this week. Here's yesterday's post about The Cross on Pagan Hill. Many years ago, when I was in third grade at Pacheco School, one of our assignments was to draw the landmarks in San Benito County. One was a cross on a hill, which I drew not paying attention to what Mrs. Apsley said it was all about and where it was. For many years I thought the cross was some where on Pacheco Pass. 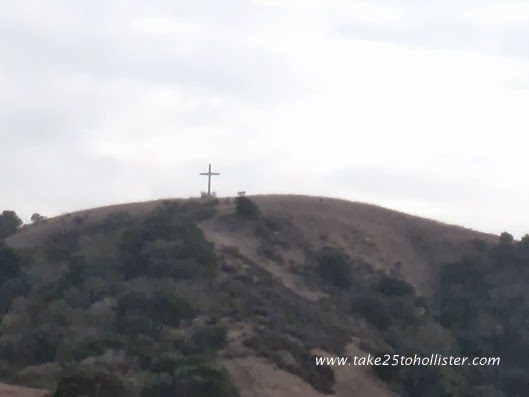 Even though I now know the landmark refers to the cross on top of Pagan Hill above San Juan Bautista, I still find myself scanning the mountains for a cross whenever I drive up Highway 156. Perhaps there is one up on Lover's Leap. So, what about the cross? Pagan Hill, also known as Mount Holy Cross, was a sacred place for the Mutsun tribe. When the missionaries found that the natives went up to the spot to do their own religious practice, they, the friars, decided to erect a wooden cross as a way to convert the Mutsuns to Catholicism. This was around 1803. A farmer took down the cross about 50 years later. Flash forward about another 50 years when someone or some group put up at wooden cross in the same spot. In 1929, that was replaced with the concrete cross that we see today. The past few evenings I have been enjoying Hollister by Joseph M. McMahon and Peter Sonné, which is part the Images of America series published by Arcadia Publishing. Have you read it yet? It's a wonderful introduction to the history of our area. 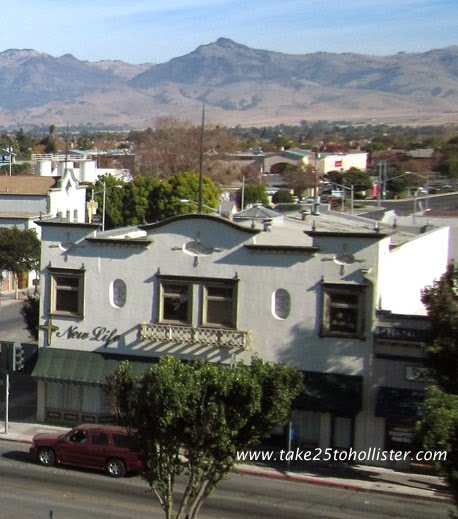 One of the things I learned is that the building on the southeast corner of San Benito and 4th Streets originally was a business called the Hollister Rochdale Company. Then I pulled out The Historic Downtown Walking Tour booklet by Sharlene Van Rooy to find out that Rochdale was a grocery store and it collapsed during the 1906 Earthquake. The following year, a new building was constructed. Yup. That 106 year-old building is now the home of New Life Fellowship. Note: So that FCC won't get on my case, the above link leads you to Amazon.com. And, if you happen to purchase Hollister via that link (or this link), I get a bit of change for my effort of referring you to the page. 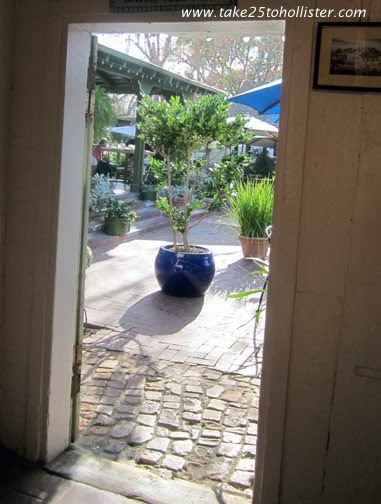 The Husband and I had no idea what we had been missing when we stepped into the Inn at Tres Pinos last month for dinner. Everything about the restaurant was quite delightful. 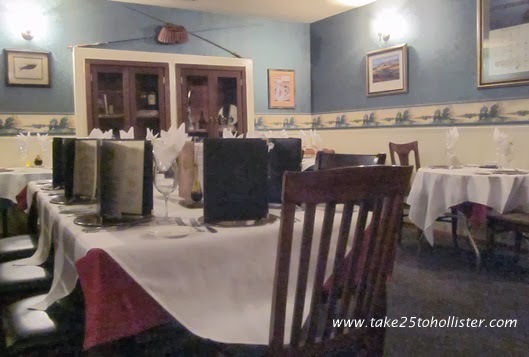 The setting was intimate and comfortable, the servers were friendly and efficient, and the food and drink were heavenly. Built in 1880, The Inn at Tres Pinos is a Historical Landmark. Once upon a time, it was a brothel, but that isn't the sole reason for having achieved landmark status. Check out this web page for more history about the place and Tres Pinos. Earlier this month, I hung outside watching the sunrise. I'd forgotten how grand it is to wake up, rather than go to bed, before the sun lights up the sky. The root beer floats from the A&W on the corner of South & East Streets are delicious memories. 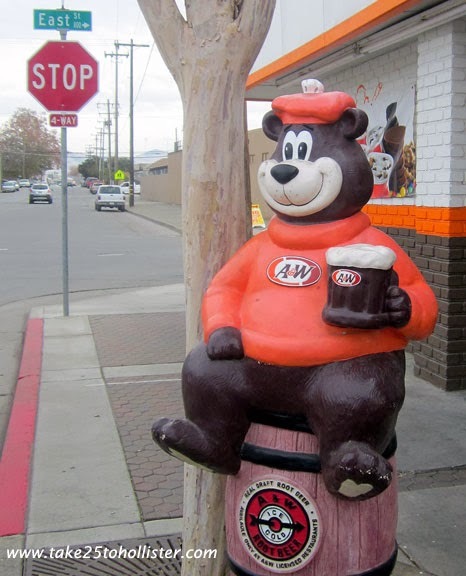 One of these days, I'll give in to the A&W bear's invitation and see if the A&W's root beer float tastes just as good as I remember. 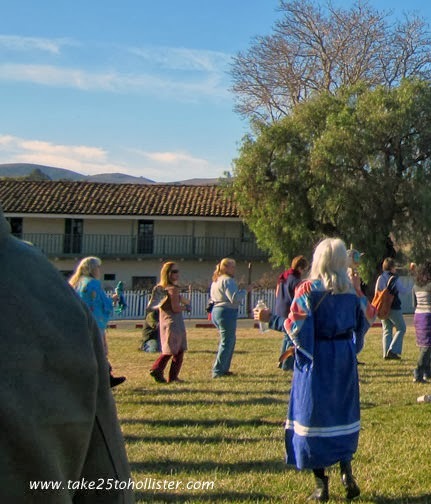 This morning, the Husband and I joined about 80 folks or more at the San Juan Bautista State Historic Park Plaza Green to participate in the Sacred Rain Ceremony presented by the San Juan Intertribal Council led by Sonny and Leynee Reyna. Also joining in prayer and song were Ann Marie Sayers and Canyon Sayers from Indian Canyon in Hollister. The blue sky was quite clear when the ceremony began. By the middle of the ceremony, clouds came creeping in from the south and west. Coincidence? Maybe. Maybe not. Let us not question though. In each our own way, let us continue hoping and praying for a gentle, nourishing rain to feed the Earth, the animals, and us, all. 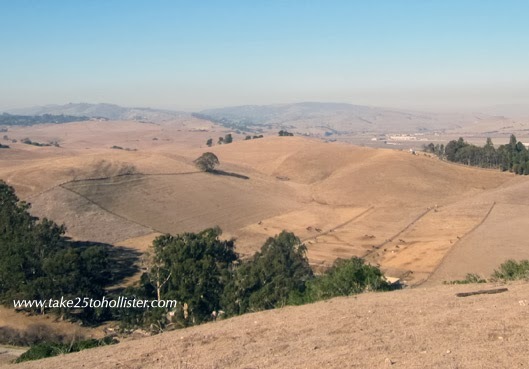 The hills surrounding San Juan Bautista ought to be green by now! It is official. Yesterday, Governor Brown declared the State of Emergency about our drought conditions. 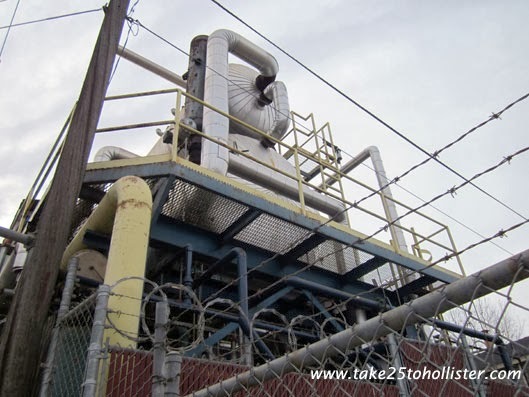 Bottom line: The Governor urges that everyone -- from individuals to farmers, small businesses, big corporations, public agencies, nonprofits, and others -- to use less water. Specifically, Governor Brown strongly suggests that everyone reduce their water usage by 20 percent. To read Governor Brown's State of Emergency drought proclamation, click here. For water conservation tips, check out Save Our Water. 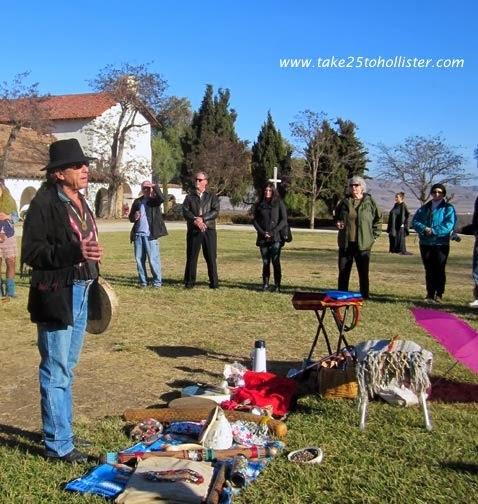 Tomorrow, Sunday, January 19, at 9:30 AM, the San Juan Intertribal Council and San Juan Bautista community will hold a Sacred Rain Ceremony on the San Juan Bautista State Historic Park Plaza Green. The ceremony will be presented by Leynee and Sonny Reyna of the San Juan Intertribal Council. They ask that everyone bring a bottle of water and a cup. And, if your umbrella is handy, bring that as well. You never know! These days I can only have coffee once in a long while, and when I do it needs to be the decaf stuff. I might as well go without rather than drink decaffeinated, right? Then Vertigo Coffee in San Juan Bautista made me a cup of decaf. Whoo-hooo! The taste. The aroma. Sigh. I was in heaven. Vertigo Coffee, at 81 Fourth Street, is now open until 7 pm, Tuesday through Sunday. Check out their hours and more at their website. For those of you who haven't been to Vertigo yet, you can also order teas and chocolates as well as pizzas, breakfast wraps, and other dishes. Muenzer's is alive and well, despite the rumors that it no longer exists. When the business closed its doors at 221 Fifth Street as Muenzer's Cyclery and Sports Center in 2012, it immediately began operating next door, 217 Fifth Street, as Muenzer's Locksmithing. Back in its original storefront, the family-run business has already expanded and now sells local apparel such as Baler sweatshirts, along with offering locksmith services. 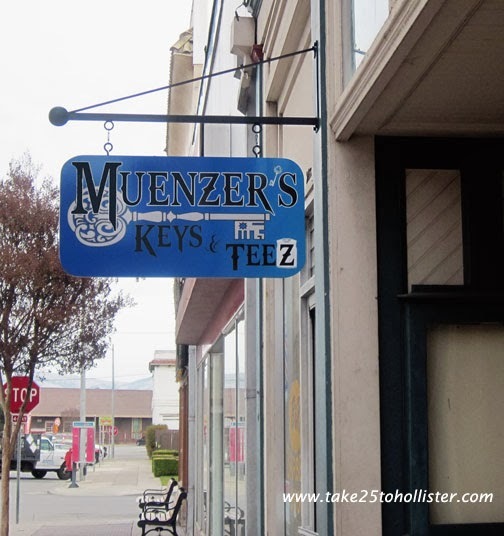 Today, the 103-year-old local business is formally known as Muenzer's Keys & Teez. Way to go, Muenzer's! 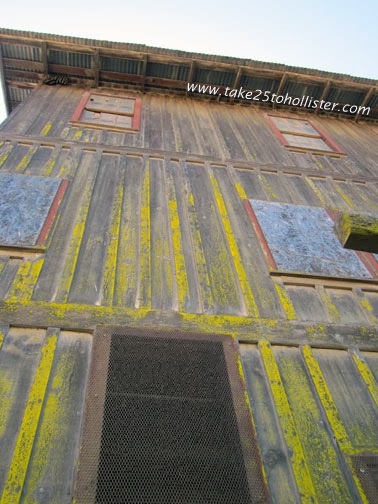 Don't you just love the old architectural styles of houses in downtown Hollister? 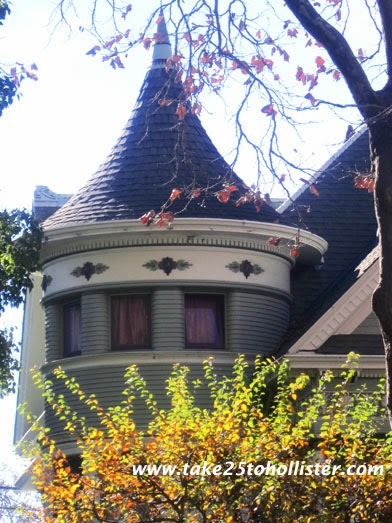 Check out the turret of the Frankie Orr house across from the San Benito County Library, for example. 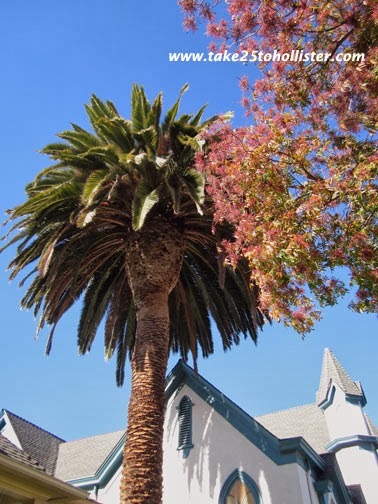 Built in 1900, the house was designed by William H. Weeks, a well-known California architect who also designed the old brown-stoned City Hall (a few buildings to the east of the current City Hall), the Masonic Temple, and the original buildings of San Benito High School. FYI: The links for the Masonic Temple and San Benito High School will lead you to the postcards I designed for Zazzle. FCC wants you to know that I receive a pittance of a royalty and referral fee for anyone who purchases the postcards. Can you imagine yourself behind the wheel of this Ford Model T Touring Car? The car was built in 1910 in Michigan, which was the same year that Tiffany Motor Company opened for business. And, that is where this Model T was on display over the holiday season. (It may still be up.) 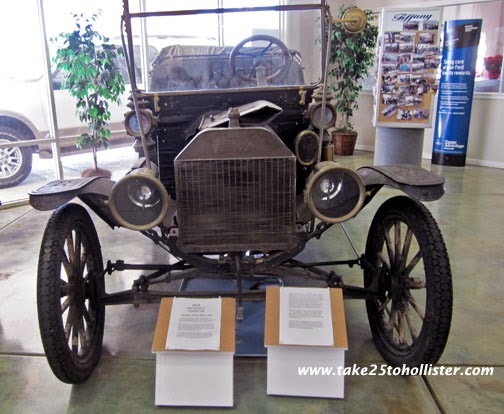 According to the exhibit notes, Tiffany sold three of these 1910 Model T's. The notes also say that the car still runs! Palm trees often make me think of dreadlocks and of Sideshow Bob, a now-and-then character on The Simpsons. I've spotted quite a few palm trees resembling that cartoon character around town. How about you? P.S. This church is what was reflecting in the window across the street. On the east and west corners of Monterey and Sixth Streets stand two churches. 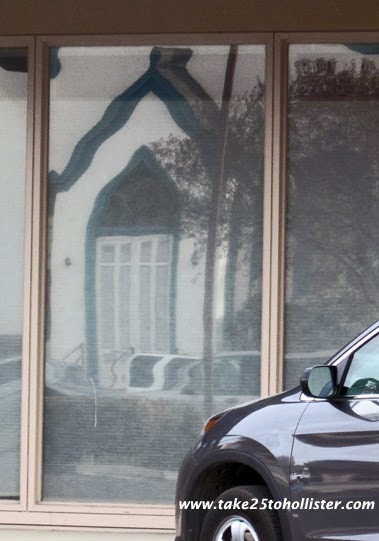 Did you know that if you look at a window of the Grace Bible Church of Hollister (east side of Monterey Street), you can see the reflection of the Hollister Church of Christ across the street? Yup. 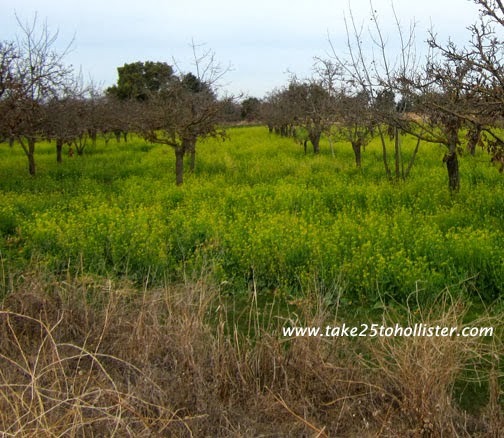 This morning I saw an orchard on Enterprise Road full of wild mustard. I was quite surprised since there hasn't been rain since November. 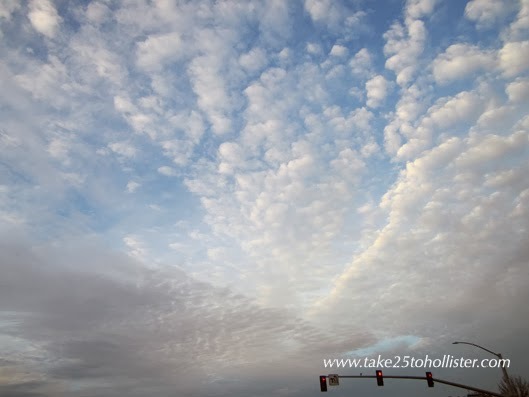 This is how the sky looked earlier this week in Hollister, as we walked out of Safeway. I'd never seen such a sight. The photo doesn't do it justice at all. 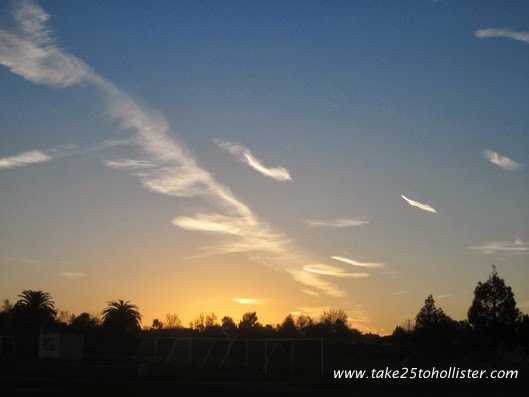 I'm participating in Skywatch Friday. Click here to see photos from around the world. 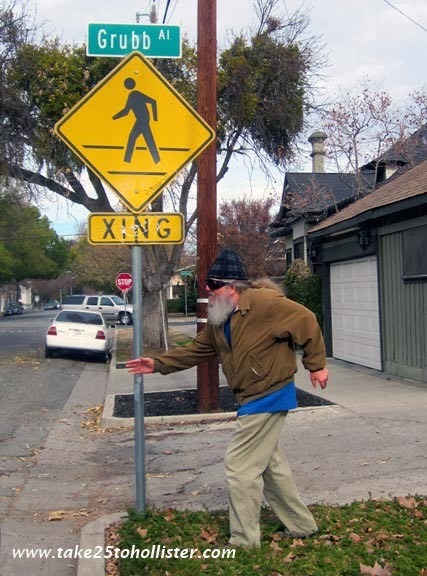 Show of hands: Who knows where Grubb Alley is in downtown Hollister? Hmmmm. That's where this fellow (the Husband) is standing? U-hem. After nearly 66 years in business, Penny Wise Drug, at 549 San Benito Street, will be locking its doors for the last time on January 12, 2014. Big, big Bummer! I will miss seeing Joan, Jeanne, and Stephen Rosati in downtown Hollister. 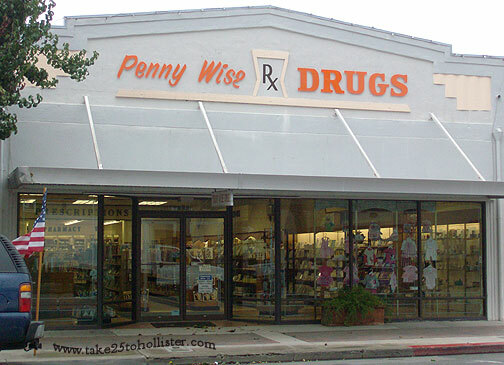 Starting today, Penny Wise Drug is holding it going-out-of-business sale. And, the sale is a bargain. Discounts range between 30 to 60 percent off. Pharmacists Jeanne and Stephen filled their last prescriptions on December 26, closing the only independent pharmacy in Hollister -- for that matter, San Benito County. All of their customers' files have been moved to the recently opened Walgreens at the corner of Tres Pinos Road and Highway 25. For me, it's already not the same. I will miss the comfort of opening the back door to Penny Wise Drug and calling out, "Hello!" and hearing a welcoming greeting from one or two, and sometimes all three of the Rosati siblings. I will miss looking at their shelves of OTC items and seeing something that I recall my dad bought from Penny Wise Drug when I was a kid many years ago. I will miss being able to purchase items that I will now have to order online or wait until my next trip to a natural grocery store in Santa Cruz. I will miss the professional advice of Jeanne and Stephen, as well as seeing what gorgeous bohemian skirt Jeanne is wearing and what handsome Hawaiian shirt Stephen has on. I will miss chatting with the lovely, lively Joan who for the longest time I called Carol and she never corrected me. 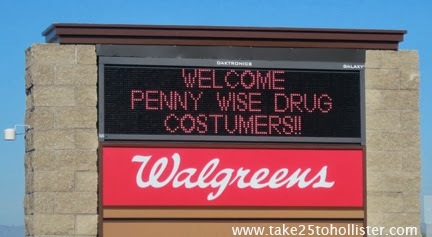 I am very fortunate to have experienced the helpful cheer of a small business and hometown wonder as Penny Wise Drug. And, I thank you very much, Rosati Family, for your wonderful assistance and service to my family and to our community. Best wishes to you, Joan, Jeanne, Stephen, and Marie on your new adventures!